Sir Isaac Newton (1642-1727) was an English physicist, astronomer, mathematician, theologian, alchemist and government official. He is one of the most well known scientists in world history for his Theory of Universal Gravitation, his Laws of Motion, and his theories in optics, as well as invention of differential calculus. In addition, Newton invented the reflecting telescope, and made numerous other contributions to his fields of study. His Classical mechanics comprises the four main fields of modern physics (alongside the later fields of electricity and magnetism, thermodynamics, and quantum mechanics). Proving the value of Biblical scientific foreknowledge, Newton attributed his insights to his efforts in translating the Bible: "Amongst the Interpreters of the last age there is scarce one of note who hath not made some discovery worth knowing; and thence seem to gather that God is about opening these mysteries." Newton's view of science was that far more remained undiscovered. "I do not know what I may appear to the world; but to myself I seem to have been only like a boy playing on the sea-shore, and diverting myself in now and then finding a smoother pebble or a prettier shell than ordinary, whilst the great ocean of truth lay all undiscovered before me." Newton rejected basing scientific theories on assumptions rather than observations. "Hypotheses non fingo," Newton famously declared, which is Latin for "I feign no hypotheses." This stands in contrast with the Theory of Relativity that is contrary to Newtonian physics. Newton emphasized that conclusions are drawn from experiments, "But hitherto I have not been able to discover the cause of those properties of gravity from phenomena, and I frame no hypotheses; for whatever is not deduced from the phenomena, is to be called an hypothesis; and hypotheses, whether metaphysical or physical, whether of occult qualities or mechanical, have no place in experimental philosophy." In 1705, in recognition of Isaac Newton's role as master of the Mint, Queen Anne knighted him. It was the first knighthood to be given for scientific achievement rather than prowess on the battlefield or work in government. Newton is often seen as one of the most influential men in all of history and perhaps the greatest scientist ever. His work was influential in shaping the philosophical outlook of the entire Enlightenment, especially after writers such as Voltaire published simplified versions comprehensible to the non-scientist. Newton was born on Christmas day December 25, 1642 in Woolsthorpe, Lincolnshire; his father, also Isaac, died before his birth. The senior Isaac Newton (1606–1642) was a wealthy but illiterate farmer who left extensive lands as well as goods worth £459, including a flock of 235 sheep and a herd of 46 cattle. The annual income was about £150, and Newton drew on that income to supplement his college fellowship while at Cambridge. The Newtons were a well-to-do, upwardly mobile family of farmers, but never had a prominent member. When he was a little more than two years old, his mother Hannah (1610–1679), remarried, and his upbringing was taken over by his maternal grandmother. He began his schooling in neighboring villages, and, at ten, was sent to the grammar school at Grantham, the nearest town of any size. He boarded during terms at the house of an apothecary from whom he may have derived his lifelong interest in chemistry. The young Newton seems to have been a quiet, not particularly bookish, lad, but very ready with his hands; he made sun dials, model windmills, a water clock, a mechanical carriage, and flew kites with lanterns attached to their tails. Throughout his life he built mechanical devices and fashioned his own tools for high-precision work. In 1656, Newton's mother, on the death of her second husband, returned to Woolsthorpe and took her son out of school with the idea of making him a farmer. He hated farming. His mother, after considerable persuasion by his teacher at Grantham, who had recognized his intellectual gifts, allowed him to prepare for entrance to Cambridge University. In June 1661, he was admitted to prestigious Trinity College as a lowly "sub-sizar" (a student required to do work-study). The main curriculum was the study of Aristotle, but early in 1664, as Newton's notebooks indicate, he began an intensive self-study of geometry, Copernican astronomy and optics. On his own he read Descartes, Pierre Gassendi, Galileo, Robert Boyle, Thomas Hobbes, Kenelm Digby, Joseph Glanville, and Henry More. He was a loner with only one friend, but he was stimulated by the distinguished mathematician and theologian Isaac Barrow, Lucasian Professor of Mathematics, who recognized Newton's genius and did all he could to foster it. Newton took his bachelor's degree in January 1665 and was selected for a scholarship in 1664 and a fellowship in 1667. Upon taking his MA he became one of Trinity college's sixty fellows, with an income of £60, part of which came in the form of room and board. He had no duties at Trinity over the next 28 years; he did no teaching apart from a few lectures (to nearly empty halls) and tutoring an occasional student. At the urging of Isaac Barrow in 1669 he wrote out some of his findings, which circulated in manuscript. He invented the reflecting telescope, which caused a sensation in London in 1671 and his election to the Royal Society. Newton became Lucasian professor of mathematics in 1669 at £100 per annum. Added to his fellowship and family estate, Newton was well off. He spent most of his time with experiments in alchemy and speculations in Arian theology, which had no influence whatever at the time or later. Newton made enemies easily, with an almost paranoid style of disputation. Many scientists in the era were repeatedly charging each other with plagiarism, and sometimes hid their discoveries in code so that in future years they could decode the message and claim priority. In 1704 he published his great book on Opticks, which had been mostly written three decades before. After his death and burial, Newton was exhumed so he could be buried in a more prominent location in Westminster Abbey. During this exhumation process, it was discovered that Newton had large amounts of mercury in his body, probably as a direct result of his alchemical experiments. Exposure to large amounts of mercury may explain Newton's eccentricity in his latter years, as well as his cause of death. Publication in 1687 of the Principia, considered by many to be the most important scientific publication ever, made Newton one of the best known intellectual figures in Europe. 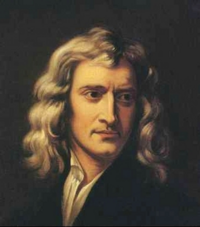 At the same time Newton became a leader of the University against King James II, who was promoting Catholicism there. When James was overthrown, Newton's political reputation soared. In 1694 he suffered an emotional breakdown and his intellectual productivity ended. In 1696 he left Cambridge for London, where he became Warden of the Royal Mint. The appointment was intended as an honorary sinecure for England's most famous intellectual, but Newton characteristically threw himself into a successful effort to reform the nation's coinage and crack down on counterfeiters. He became Master of the Mint in 1699; in 27 years as Master he averaged an income of about £1650 a year, one of the highest salaries in London. He was president of the Royal Society from 1703 to his death, turning that honorific position into an operational one that upgraded the Society's usefulness. In 1705 he became the first scientist in European history to be knighted. Newton never married, but he brought his niece to London as his hostess and lived in upper class style. Newton broke ground with his innovative work founding the field of calculus. He had been motivated by the need for alternate ways to compute pi. He isolated a formulation of pi as the area under an arc of the unit circle; thus to calculate pi he would only have to compute this area. Whereas Pierre de Fermat had already worked out how to compute the areas under polynomial curves, Newton faced a curve given by a formula involving a square root. To solve this problem, he re-expressed the square root in terms of an infinite sum of polynomials—this was the motivating idea for his generalized binomial theorem. The standard binomial theorem gave an expansion for (x+y)n for any nonnegative integer n. The resulting expression involves binomial coefficients. Newton's work extended this theorem to all real values of n, by using convergent infinite series and generalized binomial coefficients. Therefore, to compute the area under the arc, he simply had to use Fermat's theorem to compute the area under each of the polynomial terms of the infinite series and then add them together (proving along the way that this sum converges). Proceeding from this method, Newton formulated the idea of integration—a computation of the area under any curve by using infinite series of areas. He followed that with a method for differentiation, and came upon the fundamental theorem of calculus, which relates differentiation and integration. Having invented the calculus, he put aside mathematics for two years and turned to physics. Although Newton had communicated his discoveries in the calculus privately, he did not publish anything formal about it until finally, in 1704, he published Opticks. In the meantime the German mathematician Gottfried Wilhelm Leibniz had developed his own very similar version of the calculus. Both mathematicians used similar ideas of infinitesimals to smooth out details of division by zero and other seeming mathematical obstacles. Although Leibniz acknowledged that Newton was earlier, a nasty priority conflict broke out in the 1710s. Newton and his (mainly English) followers accused Leibniz of plagiarism, and the Germans retaliated in kind. The modern view is that both mathematicians discovered the calculus independently. The symbolism in modern use comes from Leibniz and 18th century French mathematicians. While waiting out The Plague he began to investigate the nature of light. White light, according to the prevailing theories, was homogeneous. His first experiments with a prism provided the true explanation of color. Passing a beam of sunlight through a prism, he observed that the beam spread out into a colored band of light (spectrum) like a rainbow. While others had undoubtedly performed similar experiments, it was Newton who showed that the differences in color were caused by differing degrees of refrangibility. A ray of violet light, for example, when passed through a refracting medium, was refracted through a greater angle than a ray of red light. His conclusions, checked by ingenious experiments, were that sunlight was a combination of all the colors and that the colors themselves were monochromatic (his term was "homogeneal"), and separated merely because they were of differing refrangibility. Newton developed the Theory of Universal Gravitation, more commonly known as gravity, when, according to Newton himself, he was thinking about the moon and saw an apple fall one day. It fell straight down, and why was that? Then he had one of the most astonishing and brilliant thoughts in human history: the moon and the apple were just alike and both were being drawn straight toward the earth. What then kept the moon up there, or the four moons of Jupiter in their orbits? His theory stated that all matter is attracted to matter by a force, whose strength increases proportionally to the mass of the objects involved, and inversely proportional to the squared distance between them. The moons stayed in place because they had a momentum that offset gravity and forced them into elliptical orbits. Newton's theory is based on action-at-a-distance which has always been opposed by some scientists, and now most physicists endorse the very different theory of relativity. Both theories predict identical results at small scales, similar results at the scale of the solar system and very different results at cosmological scales beyond the solar system. Newton had already made great progress in his devising "method of fluxions" (the infinitesimal calculus). During the plague years he recorded his first thoughts on gravitation, inspired by watching an apple fall. It fell straight down—why was that? He was trying at that time to determine what type of force could hold the moon in its path. The fall of the apple led him to think that it might be the same gravitational force, suitably diminished by distance, that had acted on the apple. Thereby he discovered the law of gravitation (attraction is proportional with inverse distance squared). He verified his conjecture approximately by a numerical calculation. He did not, at the time, pursue the matter, because the problem of calculating the combined attraction of the whole earth on a small body near its surface was obviously one of great difficulty. Newton struggled with how to conceptualize gravity. He had early rejected Descartes's vortex account of the cause of the motion of the planets. Descartes had argued that forces were transmitted through contact and that this required that matter be continuous and that hence there could be no vacuums. As early as 1665 Newton attempted to find a physical explanation of the cause of gravity but never found a suitable answer. As Newton said later in his Principia, "I have not as yet been able to deduce from phenomena the reason for these properties of gravity, and I do not feign hypotheses. For whatever is not deduced from the phenomena must be called hypothesis; and hypotheses, whether metaphysical or physical, or based on occult qualities, or mechanical, have no place in experimental philosophy". Thus Newton offers no explanation of gravity but shows through his mathematics that it "acts" in accordance to the mathematical laws he offers us in the Principia. This was a difficult approach for his contemporaries to accept. Robert Hooke, in particular, saw experimentation as the heart of science and disapproved of Newton's focus on theory and mathematics. Later in life, as a holder of the Cambridge Lucasian chair of mathematics, Newton worked out his initial ideas into a set of mechanical laws, with his second and most important law: Force is the rate of change of momentum with respect to time. This can often be simplified, in the case of constant mass to the well known . Newton was the first to understand the concept of inertial forces, notably the centrifugal force, although Christian Huyghens was close to understanding this effect. In 1684 Newton proved that Kepler's laws follow from his own second law in conjunction with his gravitational law. This proof completed the astronomical revolution initiated by Nicolaus Copernicus. Newton avoided publishing his results, preferring to communicate them to close colleagues. It took Edmond Halley great efforts to convince Newton to write his opus magnum Philosophiae Naturalis Principia Mathematica ("Mathematical Principles of Natural Philosophy" written in Latin, it was called the Principia) that appeared in 1687. A second expanded edition appeared in 1713. It was a work on mechanics that used Newton's new principle of universal gravitation to explain falling bodies on the earth and the motions of planets and comets in the heavens. The first part covers dynamics and includes Newton's three famous laws of motion. The second part concerns fluid motion; the third part deals with "the system of the world" ("De mundi systemate"), that is, the unification of terrestrial and celestial mechanics under the principle of gravitation and the explanation of Kepler's laws of planetary motion. The material was very advanced and difficult, especially since the underlying calculus was deliberately hidden from view. Scientists across Europe immediately recognized its importance and tried to read it. Feingold (2004) explains the rapid dissemination of Newton's science came first via the members of the Royal Society, both British and Continental. The scientists, mathematicians, and philosophers of Germany, Holland, France, and Italy read the editions of the Principia and the Opticks and taught the ideas to their students. Newton's work was widely accepted, except in Italy, where the Catholic Church, having silenced Galileo, tried as well to suppress Newton's ideas. Despite the importance of Descartes to the French, Newton carried the day in France. Voltaire in particular made Newton the great hero of the modern world of ideas. Voltaire's Elemens de la philosophie de Neuton, (1737), was a success that rendered Newton intelligible and his work accessible, to the nonspecialists and amateurs who flourished in the Enlightenment. In Germany Leibniz praised Newton's Principia, but was uncomfortable with Newton's position regarding gravity. It was philosophically untenable to merely dismiss the problem of its cause. French scientists, especially Pierre Simon Laplace (1749-1827) developed and systemized Newton's ideas into modern Classical mechanics in the late 18th century. Newton's science dominated science and educated thought throughout the 18th century, being seen as the highest achievement of pure reason and classical culture. In the 19th century, however, Romantic scientists went in entirely new directions, exploring non-Newtonian topics in electricity, magnetism and thermodynamics, and in mathematics turning to topics unrelated to calculus, like group theory. The leading German poet, Johann Wolfgang von Goethe - who was also a renowned Natural philosopher - even tried to challenge Newton's optics. Newton was a sincere religious believer, who said his discoveries were inspired by God. He devoted more time to the study of Scripture than to science. Newton wrote, "This most beautiful system of the sun, planets, and comets, could only proceed from the counsel and dominion of an intelligent Being... All variety of created objects which represent order and life in the universe could happen only by the willful reasoning of its original Creator, Whom I call the Lord God." Newton believed that God's creation of the universe was self-evident given its grandeur. He also warned against using his laws to replace the creator. He said, "Gravity explains the motions of the planets, but it cannot explain who set the planets in motion. God governs all things and knows all that is or can be done." Newton wrote over a million words on religion—nearly all in unpublished hand-written manuscripts and unavailable for research until the 20th century. Although older scholars did not have access to his writings, "Among contemporary scholars, the consensus is that Newton was an Arian," concludes Pfizenmaier (1997). Arians were Christians but the Arian theology died out as an organized force a thousand years before; Newton read the old texts and identified himself with Arius and his beliefs. In an effort to debunk widespread claims of his time that the world would be ending soon, Newton wrote a private manuscript estimating that the world would not end prior to the year A.D. 2060. ↑ Newton's discovery of calculus was independent of, and likely before, a similar discovery of calculus by the German scientist Gottfried Leibniz. (Each accused the other of plagiarism, but neither could prove it. Newton Biography). ↑ He was born a little more that a year after Galileo died. Italy and England used different calendars, however, so there is a mistake to the effect they died in the same year. Galileo died in 1641 by the English calendar. ↑ The problem was enormously simplified when he later used his calculus to prove that, for purposes of gravity, a uniform sphere of any size can be considered as a single mass located at one point, the center. ↑ Roger Hahn, Pierre Simon Laplace, 1749-1827: A Determined Scientist. (2005). 310 pp. ↑ Westfall, Never at Rest p. 103. Westfall notes, p. 350, "No evidence at all indicates that Newton ceased to be an Arian." ↑ "I have a fundamental belief in the Bible as the Word of God, written by those who were inspired. I study the Bible daily." Tiner, J.H. (1975). Isaac Newton: Inventor, Scientist and Teacher. Milford, Michigan, U.S.: Mott Media. ↑ Webb, R.K. ed. Knud Haakonssen. “The emergence of Rational Dissent.” Enlightenment and Religion: Rational Dissent in eighteenth-century Britain. Cambridge University Press, Cambridge: 1996. p19. ↑ Newton, Isaac. A Short Scheme of the True Religion. Unpublished writing quoted in Brewster, David (1855). DeGandt, François. Force and Geometry in Newton's Principia. Princeton U. Press, 1995. 296 pp. Dobbs, Betty Jo Teeter. The Janus Faces of Genius: The Role of Alchemy in Newton's Thought. Cambridge U. Press, 1991. 359 pp. Fauvel, John et al., ed. Let Newton Be! Oxford U. Press, (1989). 272 pp. Gjertsen, Derek. The Newton Handbook. (1987). 665 pp. Gleick, James. Isaac Newton.(2003). 272 pp. Hall, A. Rupert. All Was Light: An Introduction to Newton's Opticks. Oxford U. Press, 1993. 252 pp. Kline, Morris. Mathematical Thought from Ancient to Modern Times. Volume: 1. (1972). Shapiro, Alan E. Fits, Passions, and Paroxysms: Physics, Method, and Chemistry and Newton's Theories of Colored Bodies and Fits of Easy Reflection. Cambridge U. Press, (1993). 400 pp. Thrower, Norman J. W., ed. Standing on the Shoulders of Giants: A Longer View of Newton and Halley: Essays Commemorating the Tercentenary of Newton's Principia and the 1985-1986 Return of Comet Halley. U. of California Press, 1990. 429 pp. Newton, Isaac. The Mathematical Papers of Isaac Newton, 8 vols. (Cambridge University Press, 1967–81). This page has been accessed 152,351 times.